In recent years, vaporizers, electronic cigarettes, and other Electronic Nicotine Delivery Systems (ENDS) have seen a boost in their popularity. Many brands originally marketed e-cigarettes toward adults trying to quit smoking, saying their product was a healthier alternative. These products still contain nicotine, but users no longer have to inhale a harmful smoke. 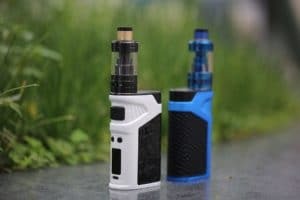 While these products have gained popularity among adults, middle school and high school children have started vaping as well. In response, the FDA hopes to put new regulations in place to keep tobacco products away from children. In surveys across the United States, schools collected data on how many of their students consistently vaped and had vaped within the previous 30 days. These surveys showed an 80 percent increase in vaping high schoolers and a 50 percent increase in vaping middle schoolers. The FDA’s website states that the percentage of high school and middle school children that vaped in 2011 was 1.5 percent and 0.6 percent respectively. In 2017, those percentages rose to 11.7 percent and 3.3 percent. Essentially, these numbers indicate that over two million minors were vaping in 2017. FDA Commissioner Dr. Scott Gottlieb, shocked and concerned with the rapid spike in minors using tobacco products, stated that he does not want these products to start “addicting a whole new generation of kids to nicotine.” In a study that ran in 2013 and 2014, researchers found that 81 percent of youth that were currently vaping listed the appealing flavors as their main reason for starting. If you look at many of the flavors offered by e-cigarette companies, many of them include flavors children love. These are flavors like cotton candy, gummi bear, buttered popcorn, and a variety of fruit flavors. Since this summer, the FDA has made moves to protect children by nicotine. They even went so far to use undercover operations to find 1,300 vape shops that were selling products illegally to minors. They also seized documents from the Juul headquarters and requested documents from other e-cig companies to look at their marketing plans and practices. Since then, Juul has removed their flavored products from retail locations but continues to sell them on their website. Since then, CVS Health and the American Heart Association have applauded the FDA and support new regulations. They agree that some companies have marketed their products to teens and young adults. Also, they want to prevent more children from establishing a nicotine addiction at such a young age. Of course, vaping associations have criticized the proposal, saying it will only harm adults that want access to a healthier form of tobacco.